(Long Island, NY) St. Joseph’s College (SJC) is pleased to announce that Paul Ginnetty, Ph.D., professor of psychology, was recently named the Suffolk County Psychological Association’s (SCPA) Psychologist of the Year. 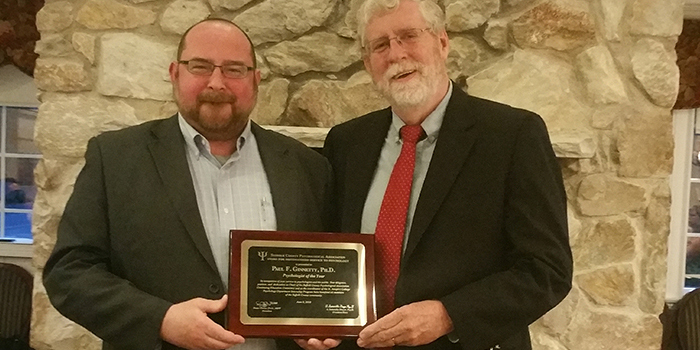 SCPA President Dr. Shane Owens (left) with Dr. Paul Ginnetty (right). Photo Credit: St. Joseph’s College. Dr. Ginnetty was also recognized for having completed 30 years as an undergraduate professor and coordinator of SJC’s clinical internships. He has served on the SCPA’s executive board of directors and ethics committee, and for the past seven years, he’s been the chair of their continuing education committee, which grants American Psychology Association (APA)-approved continuing education credits to psychologists and social workers. Dr. Ginnetty has served as director of a Catholic Charities mental health clinic in New York City, as a staff member of a chemical dependency counseling agency in Nassau County and as a staff psychologist in the student mental health clinic on the campus of Stony Brook University.